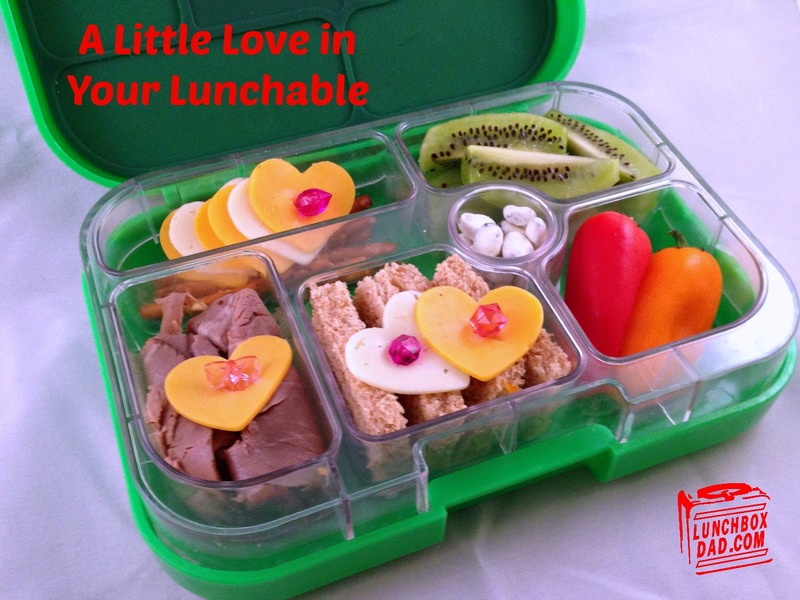 Bonus Lunch: A Little Love in Your Lunchable. Sometimes a simple lunch is best. Lunchables are a booming business and you can't go into an elementary school lunchroom without seeing those grab and go lunches. The problem is they can be expensive and unhealthy for your kids. A great alternative is making your own "Lunchable" type meal for your child. It is easier than you think and kids love taking part in assembling their own lunches. Even if you pick out the food, they can put it together however they want to! My daughter loved this lunch because she could make it her own. I put it together in this Yumbox lunchbox because it works well for smaller lunches like this one. So next time you need an easy, healthy, customizable lunch make your own homemade lunchable! 1. Using a container with multiple compartments, place your vegetables in one compartment and cut up fruit in another. 2. Slice your bread into squares and stack it in your container. Arrange your protein (meat, hard boiled eggs, etc.) next to the bread. 3. Find a place for your pretzel sticks and yogurt covered raisins. 4. Using a cookie or vegetable cutter, make the cheese into fun shapes. Spread it around the other food to decorate. You can secure food down using decorative picks or just pack it tightly enough that it wont shift. Remember to listen to what food your child enjoys but also try and have a healthy balance. Watch for my review of the Yumbox next week. Remember to follow me on Facebook, Twitter, and Pinterest so you don't miss any news and see tons of bonus items that I post! Thanks Karen, I tried to make it simple and healthy!